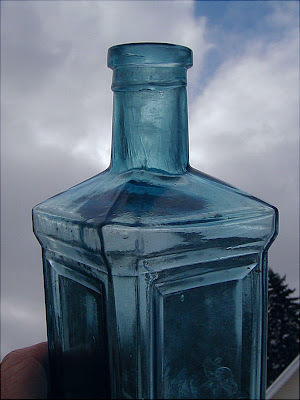 Western Bottle News: Some Close up Pictures of "Blue"
I am not sure what feature, or group of features, triggers "WESTERN" in a collectors mind. 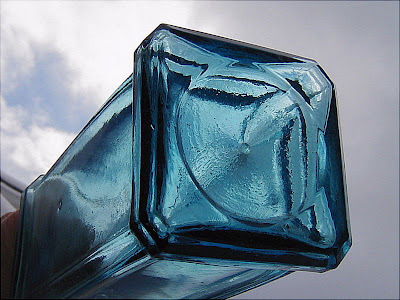 Is it the top or the shape of the indented panels or maybe the color of the piece. How about the semi flared out base. One thing is for sure. If more than one of these beauties have been recovered from the "left coast" they were more than likely distributed out here. Square collar top with a ton of spillover and what appears to be lipping tool marks on the spillover? 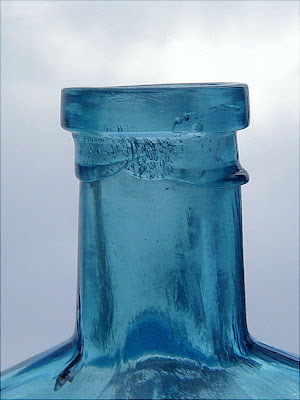 Not a very handsome top for such a regal looking bottle. Western or Eastern? The jury's still out for me. That bottle SCREAMS for embossing. Why go to the trouble to create such a fancy mold and leave the lettering out? Makes zero sense. Still, it will take more examples turning up to make a western connection. Better yet, a label. What a great bottle. For the rarity, color, form , and strong chance it's Western..... someone got a real decent buy ! A friend of mine dug one of these 40 years ago at Benica. Could it......... nahhhh. No really, could it have been a labeled Cassin's Bitters before or after the embossed corset-waisted bottles were produced??? A friend blew up what would have been a wild foamy yellow Cassin's while putting in a septic tank a couple years ago. Backhoes are "bottle killers", especially when you have no idea they are down there. Not in Sac proper, but very close. OK, I'll cop to it...I was the buyer. I received it today. It sure "feels" like a Western piece to me. The fact that one, possibly two, others were found in Nor Cal gives it a little more credence that it could be Western? I'm of course hoping so, but whatever the case, it's an awesome bottle for being a slicker! Warren, give me some clues as to what to look for under a loop?